Oblige is a narrative exploration game where you play as a lower class mother of two living in Hong Kong during the 1970s. The game consists of a unique keyboard mechanic, detailed aesthetics as well as a unique story that is based on the creator’s grandmother. The game allows the player to immerse into the role of a mother who has to choose between short-term family errands or the future of her children. The story is authentic and allows for lots of contemplation. Unique game world, allowing players to explore the unique urban aesthetic of Hong Kong in the 1970s. 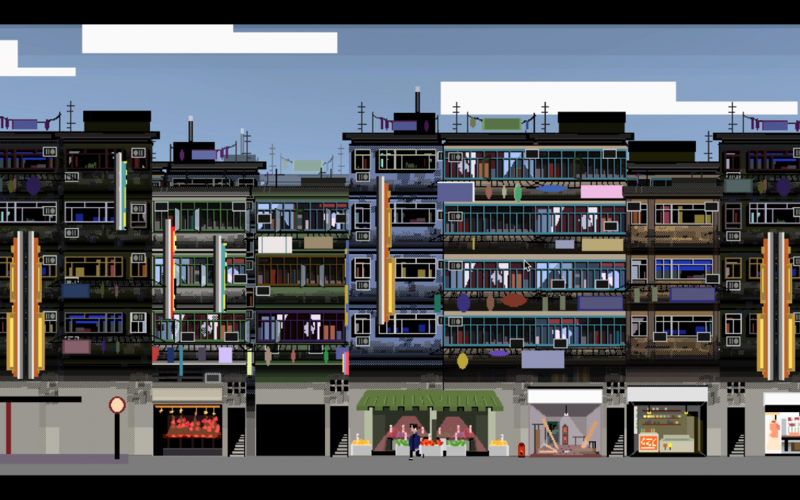 Meticulous pixel art style that presents the complexities of living in one of the densest city in the world. The narrative of Oblige is set in an environment and time period that is rarely explored, and it breaks game protagonist conventions by allowing players to immerse themselves into the role of a Cantonese housewife. This game is created for USC’s Intermediate Game Development class. The inspiration of the game came from an interest in combining a unique and fun keyboard mechanic with an emotional story. There is also an interest between the game’s creators in developing a game that can express more complex emotions, as there have been many indie games in the past few years that have succeeded in doing so. Oblige has been nominated for IndieCade Game Festival 2017, and the game can be downloaded at jocelyn.itch.io/oblige.